Sedona is a destination that I sort of stumbled upon by accident. This past summer, I was spending lots of time researching my 2.5 month drive across the USA from Toronto to LA on Route 66. Sedona was a bit of a detour, but once I looked up pictures - I knew that I absolutely could not miss this stop on our road trip. Sedona is located just south of Flagstaff in Arizona and only about an hour away from the South Rim of The Grand Canyon. 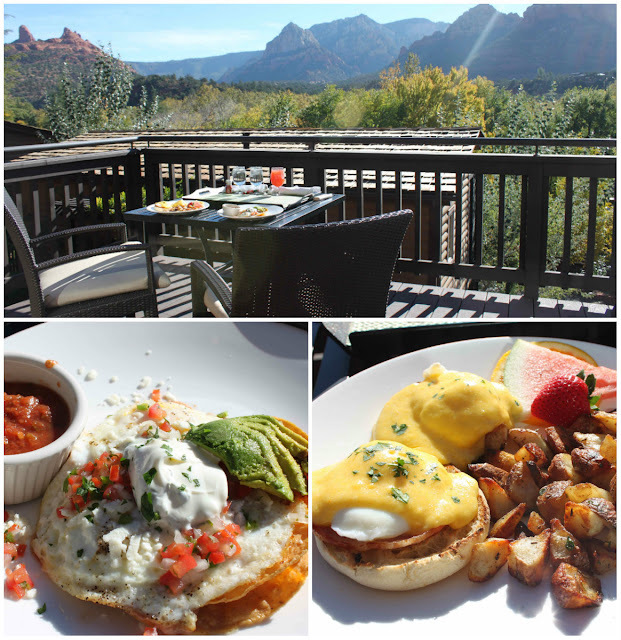 We booked two nights at the beautiful L'Auberge de Sedona to unwind a bit from all the driving we were doing. After staying just a few days - I wanted to book another week. 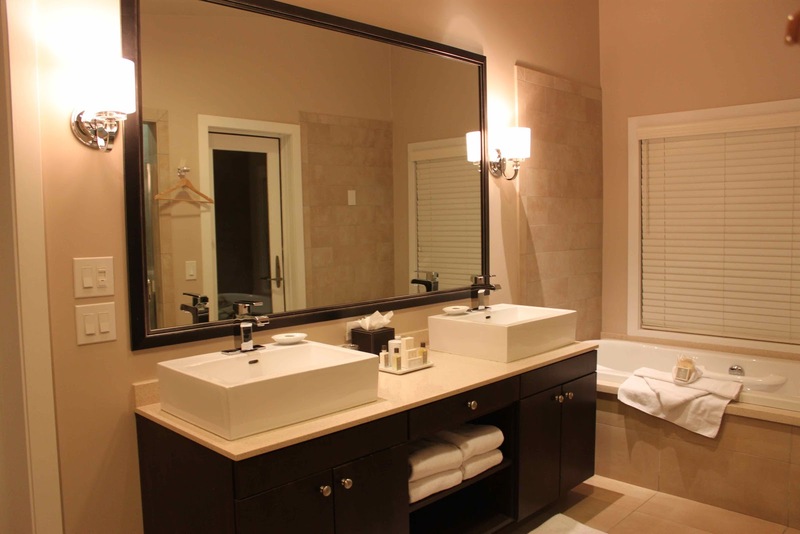 First of all, we need to talk about my DREAM bathroom inside our fully-detached cottage. The deep soaker tub had a clear view of the red canyon rock. 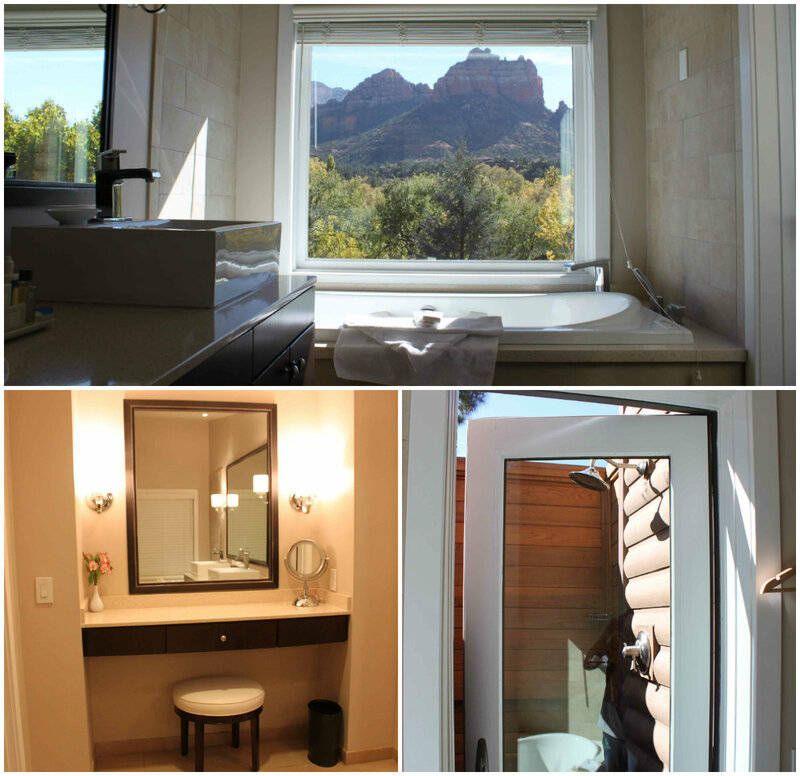 Not only was there an indoor shower, there was also an outdoor cedar shower option as well. There's nothing quite like taking a shower in the warm sun. We were treated to his and hers double sinks, a large vanity area and plush bathrobes. 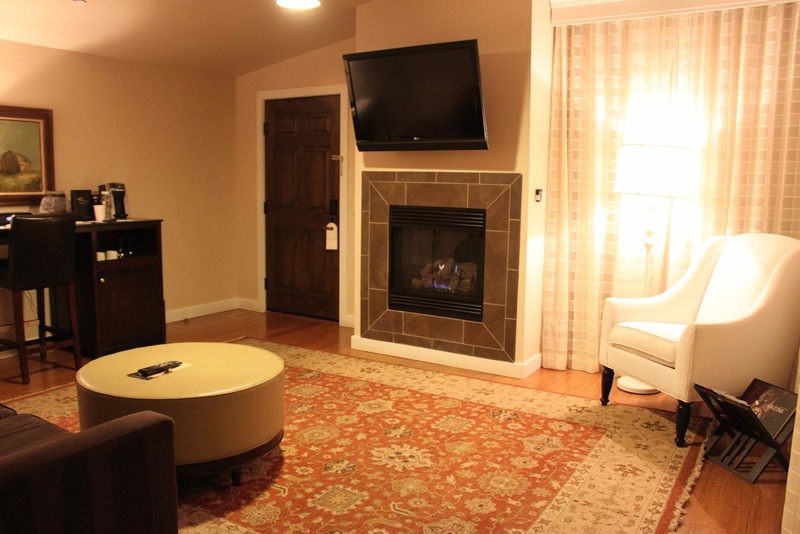 Our cottage was a very large one bedroom unit with a separate living room area complete with a fireplace, sofa and flat screen TV. We were treated to chocolates and complimentary bottled water during turn down service every night and awoke to fresh coffee care of the Keurig maker in our room. Storage space was not an issue, we were spoiled with a walk-in closet for all our luggage. Ordering In-Room Dining for breakfast was an absolute must with a view like this. Once I spotted our huge balcony with a bistro patio set and sun loungers facing the red rock, I knew it was the perfect place to linger over a long gourmet breakfast with a hot cup of coffee. The view is breathtaking and the red rock features a different shade throughout the day as the sun moves along it. The Huevos Rancheros ($15) were spot on with a big dollop of sour cream and freshly sliced avocados (top left). Feeling slightly homesick for Canadian bacon we ordered the Eggs Benedict ($18) with crispy roasted potatoes (top right). After an epic breakfast like that, a hike to one of Sedona's energy vortexes were in order. 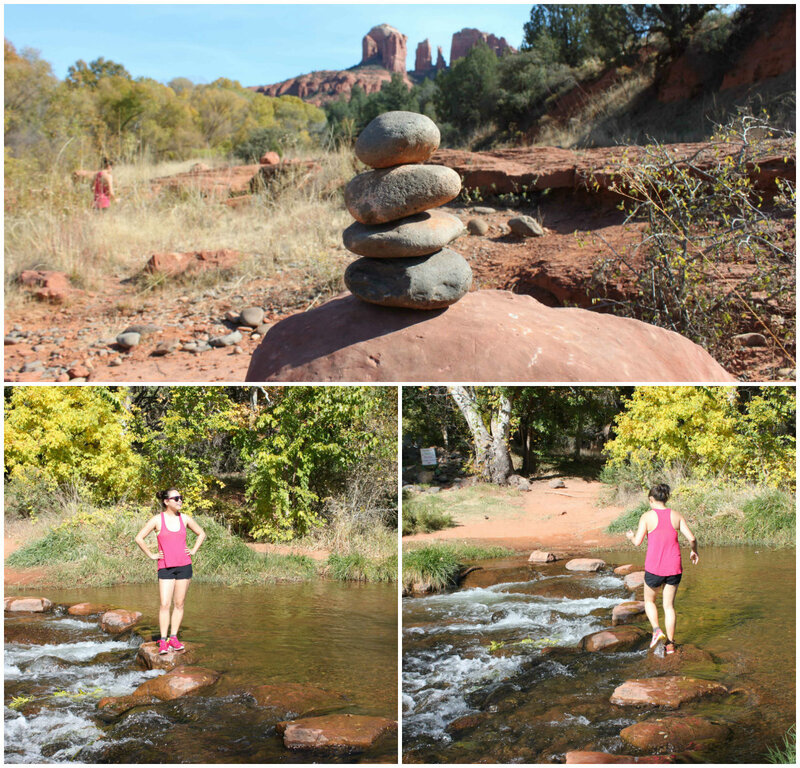 We set out for Cathedral Rock - one of the most photographed sights in Sedona and went for a hike and jog along the red earth. After crossing the river using some very strategically-placed river rocks, we were on our way to soak up all the good energy that this radiating monument had to offer. Now whether you believe in vortexes or not, Sedona is known as a place of healing and an energy centre as the town sits in the middle of four vortexes. I'm not into all the details, but I did feel uplifted, relaxed and open in a place as beautiful as Sedona. I was moved, I felt something inspiring but how could you not when you are surrounded by so much natural beauty? 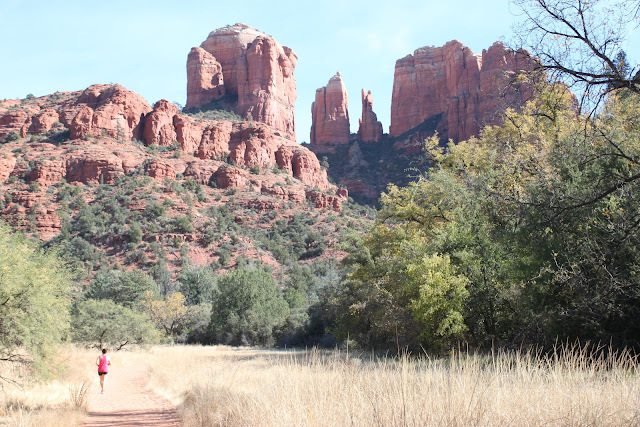 I recommend giving yourself some time in Sedona to reflect and meditate at one of the energy sites and take a yoga class, breathe deeply and book a spa treatment. I will definitely return to Sedona again and would spend a week just clearing my head on my next visit. 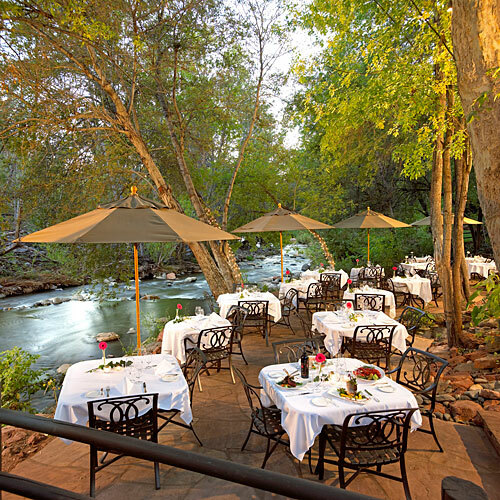 After our hike, we tucked into a gourmet three-course dinner ($64) at Oak Creek Restaurant back at L'Auberge de Sedona. The sound of the rushing river amongst the rustling trees inspired even more relaxation. 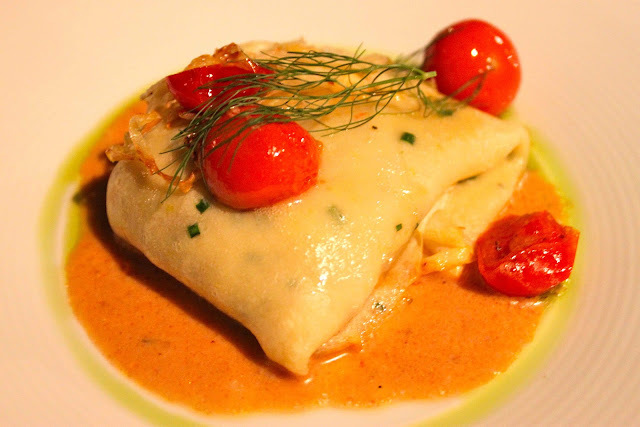 The restaurant was named one of the top 10 in the Southwest by Conde Nast Traveler and it's easy to see why. We started with the Dungeness Crab Crepe (above) in a roasted tomato, fennel and butter sauce. I ordered the Local Baby Beets Salad with cheese (top left) to start and the beets were so delicate and tender with still a satisfying crunch. We were so mesmerized by all the options on the appetizer list that we ordered a THIRD dish, the Grilled Calamari (top right) served with soft cippolini onions to compliment it. 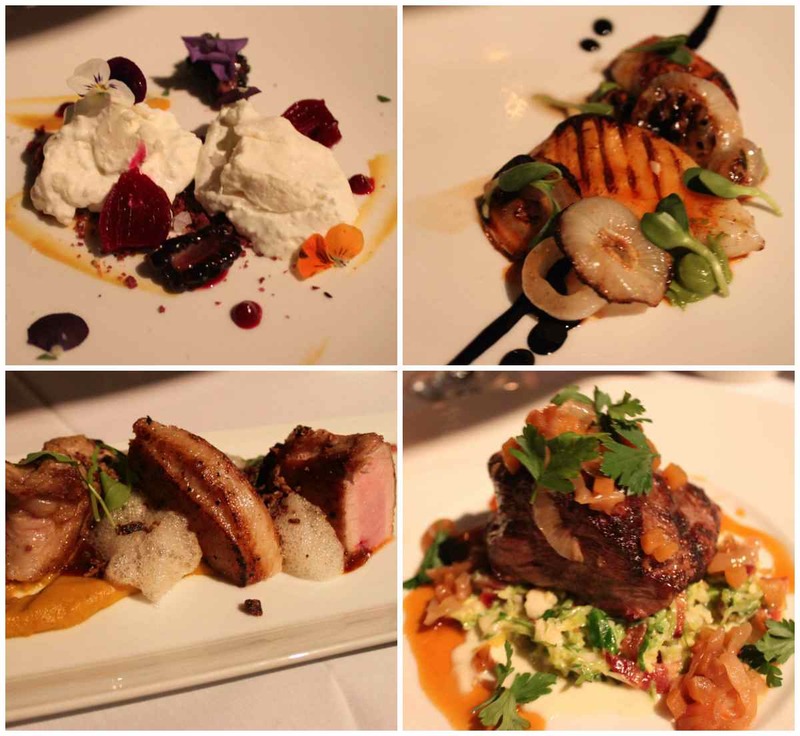 For our mains, I was very happy with my Tender Belly Pork Chop (bottom left) with apple foam! Paul ordered The Creekstone All-Natural Filet Mingon which came perfectly medium-rare. 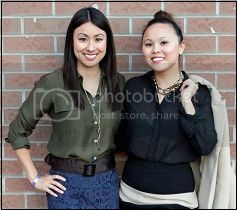 We were both incredibly pleased if not stuffed from our dinner. 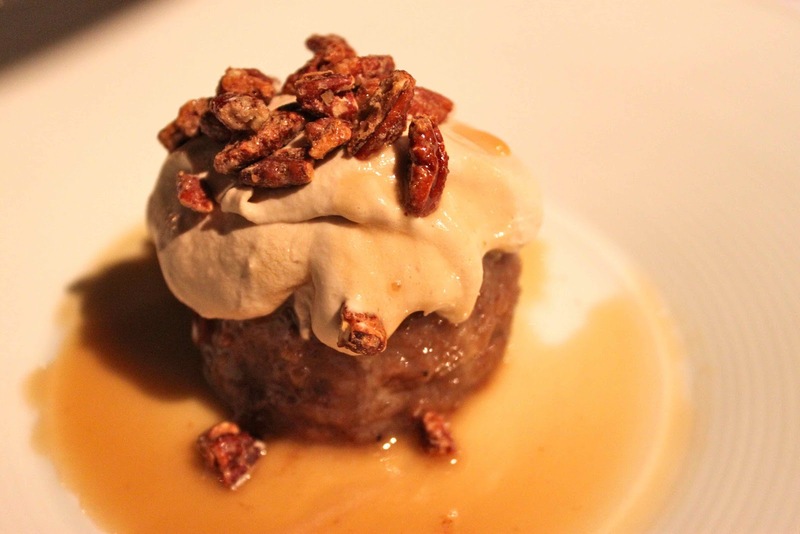 To finish it off, we share one very decadent dessert - The Sticky Toffee Pudding with candied pecans and melting ice cream all ceremoniously melting over a warm baseball of dense and heavenly pudding. After all that hiking and eating, I booked in for a Creekside Massage at the hotel spa while all my stress was melted away by a massage therapist. If you have time on your trip, I highly recommend this relaxing treatment as you listen to the sound of the rushing river. The spa area also features an outdoor pool, loungers and a hot tub. 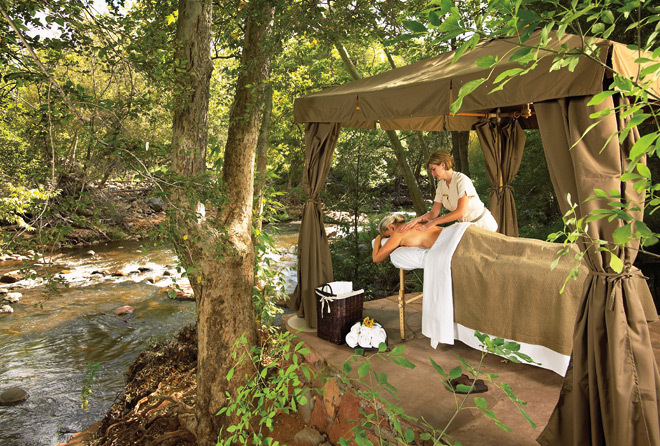 If you're looking for an easy getaway in the sun with some time for rest and reflection, do give a Sedona and google and the luxurious accommodations at L'Auberge de Sedona. The weather warms up again in the late spring, so it's a great time to start thinking about it now.